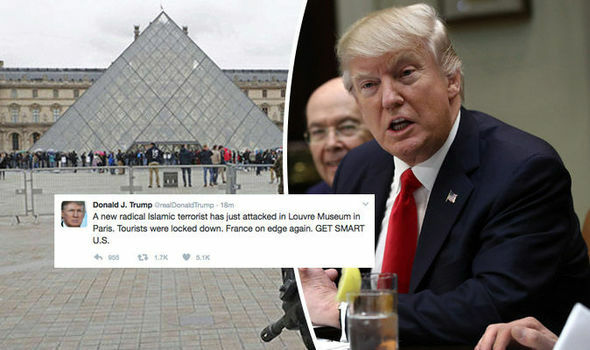 This morning at 9:30am GMT at the famous Louvre museum in Paris, a machete wielding radical Islamic terrorist attacked security forces whilst yelling, “Allahu Akbar”, before being shot non-fatally. The whole museum was evacuated and streets cordoned off, with many tourists shocked, as the tensions of fear rise up even higher in the once peaceful city. As much of his campaign had stated and which he’s now backing up with doing actual things and doing them fast; he’s safe-guarding the U.S.A. from any dangerous terrorists that are masquerading as refugees and other potential immigrants, that could have possible links to terrorist training camps in the seven temporarily banned countries, from entering into the United States for 90 days. This is something which Europe with its open borders have failed to do and its having a terrible effect of division and conflict rising in many countries across Europe, after the various coups in the Middle Eastern region, over the last few years. As we’ve seen with Germany and Sweden, the two countries baring the biggest brunt of this mass migration, have now seen escalation in crime, the likes of which have never been seen before. Numerous crimes ranging from murders, rapes, daily arsons and physical assaults, to even group rapes being on the rise, which should also class as major warning signs of what an open arms border policy truly offers to any country that’s willing to abide by such disastrous decisions. So, has Donald Trump been right all along, with his logic and common sense and for communicating to the thoughts of the people that feel in the same way? We say “Yes” and we’ve said that for a long time and that also, that the lax dangers of open borders is very much exemplified by the economic and social strain, plus increase in crime, that this mass immigration or welcoming of all refugees has done to both Sweden and Germany, as two firm examples. You can also add France to that list. We wish Paris nothing more but safety, plus we are happy that nobody else got hurt this time.